New V48.88 SBB PRO2 Key Programmer supports new cars to 2017.12, like Acura 2017, Chevrolet 2017,Buick 2017, Cadillac, GMC 2017, Ford 2017,Dodge 2017,Toyota 2017, etc. 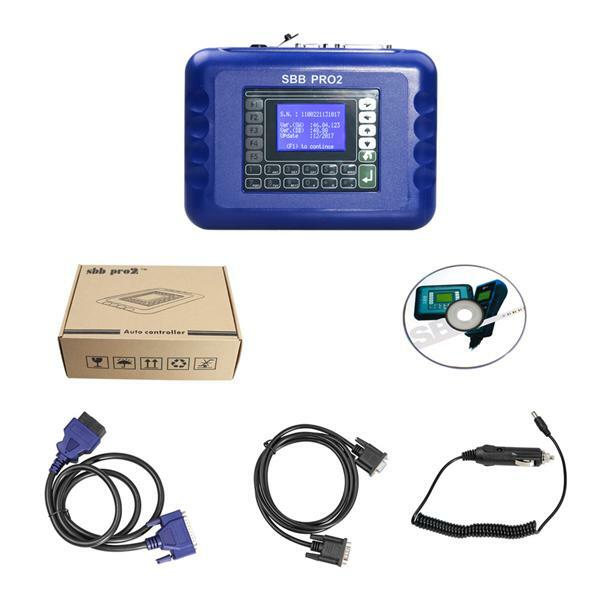 SBB PRO2 key programmer copies chip according to car model, and its programs key not clones key, you only need to insert SBB 16-pin interface into your car OBD2 diagnostic seat, then read out immobilizer pin code from immobilizer dump/EEPROM of the car before writing it into a new blank key. When programming for Ford vehicle, it does not need pin code. Q: Can it work on 2015 Nissan Sentra and 2015 Ford f150?? A: US Nissan and US Ford can support to 2017. There are many options of the device for choose, such as AU Ford, EU Ford and US Ford?. Q: Will it read pin for skim dodge? A: Hello, this device can read pin code, but not fit for your skim dodge.? Q: Can you tell me if it has 2011 Chevrolet Aveo or Aveo5 listed? Thanks.? A: Hello, for Chevrolet it supports CHEVROLET S.AMERICA, AGILE[CAN] 09-17.